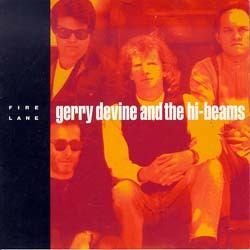 Gerry Devine and the Hi-Beams "Fire Lane"
"Fire Lane" is the debut album from Gerry Devine and the Hi-Beams, a New York City quartet whose music falls somewhere between jangly 60s-inspired pop and off-center country rock; their sound has been described as "The Searchers meet Gram Parsons" and, more simply, "Merseybeat cowboy music." Prior to starting the group, Devine was a fixture on the Greenwich Village scene that also included Suzanne Vega and Shawn Colvin. He first achieved notice with a 1989 New York Music Award for Best New Songwriter. "Fire Lane" was produced by Marc Moss, formerly of the well-regarded Delaware band Bad Sneakers; the cover was designed by Carol Bokuniewicz, who also did Talking Heads' "Remain in Light."